Varying the color of the walls and the ceiling can create depth and fun dynamism. 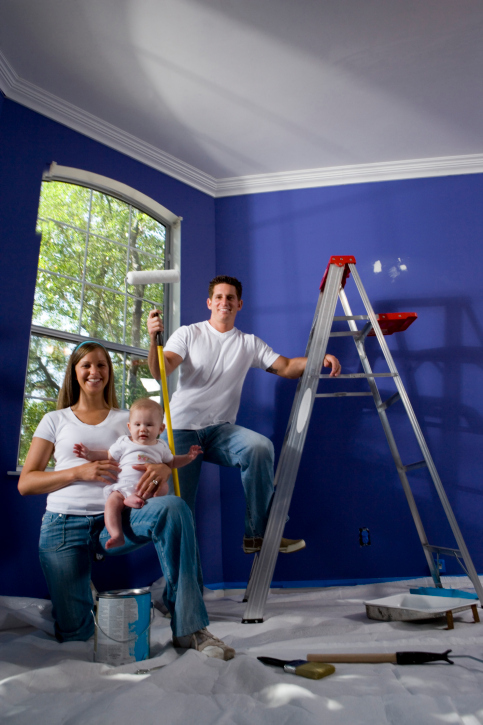 Choosing the right paint color or design for your ceiling is a huge and important part of overall interior design. Designers ever refer to the ceiling as the “fifth wall.” The ceiling is generally the largest area of uninterrupted space in any room, making the paint color or design you choose for it incredibly important to achieving a cohesive and visually striking look. The right ceiling paint also makes a large difference. For rich, lasting, sophisticated color with flair choose Benjamin Moore paint. A large room with a high ceiling can feel intimidating and unbalanced if proper steps are not taken to make the most of it. This is because all of the furnishings and pieces which add visual interest and utilize space tend to be clustered on the floor, leaving a vast empty ceiling space to contend with. This is an opportunity to utilize bold Benjamin Moore paint to play with a pattern or design, or even use paint to create the illusion of architectural features. Accent walls are a popular trend in interior design, because they allow homeowners to add exciting and unique pops of color without compromising the design flow and visual continuity of the entire house. Turning the ceiling into your accent wall with bold and highly pigmented Benjamin Moore paint could add a unique splash of visual interest to any room in your home. These pops of bright color compliment light neutral walls without drowning them out. In order to decide what color to paint your ceiling, look at the furniture and pieces in your room and pick a color which will work harmoniously with them. If you have a small space with a high ceiling, and think you may have to sacrifice your flair, you’re in luck. High ceilings beg for creative design and an artistic flair, and even require then for a room to have proper balance. Anything that maximizes vertical space by drawing the eye upward will work wonders.